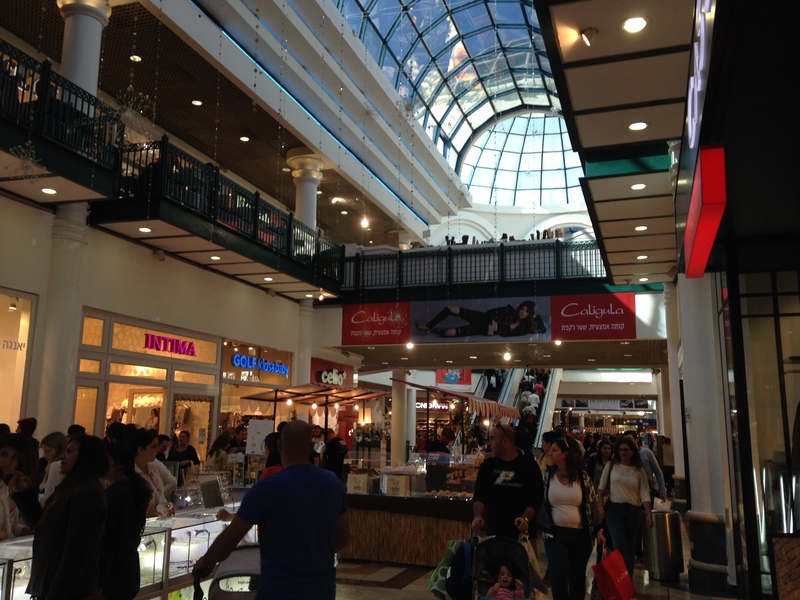 Last weekend, Noah and I went to Jerusalem’s largest and busiest mall: Malcha Mall. 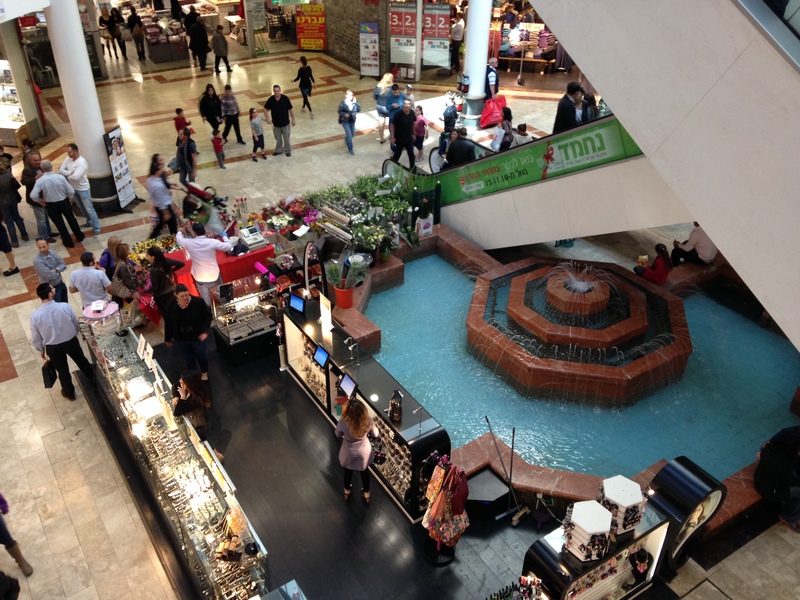 The mall is located in the Malcha neighborhood, southwest of central Jerusalem. The mall is HUGE with nearly 300 stores and, according to their website, 400,000 square feet of shopping area and another 32,000 square feet of office space. The interior of the mall looked fairly similar to any typical American mall, and there were tons of familiar American-brand stores (American Eagle, H&M, Gap, etc.). There were also some (ultra) religious folks walking around handing out Shabbat candles to the women (to make sure they lit that night!) and asking the men they saw if they had already put on tefillin. If the answer was “no,” there was a handy-dandy table set up with several sets of tefillin for men to put on and say the appropriate blessing. Side note: tefillin are cube shaped boxes worn on the head and left arm that contain the words of the Shma – the central faith statement of Judaism. It is considered a mitzvah for men to put on tefillin each day, typically during the morning prayers. I was theoretically looking for boots at the mall, but the sheer number of shops and my indecisive attitude preventing that initiative from making much progress, so I ended up mainly just window shopping and oohing and aahing at the size and eccentricities of the mall. 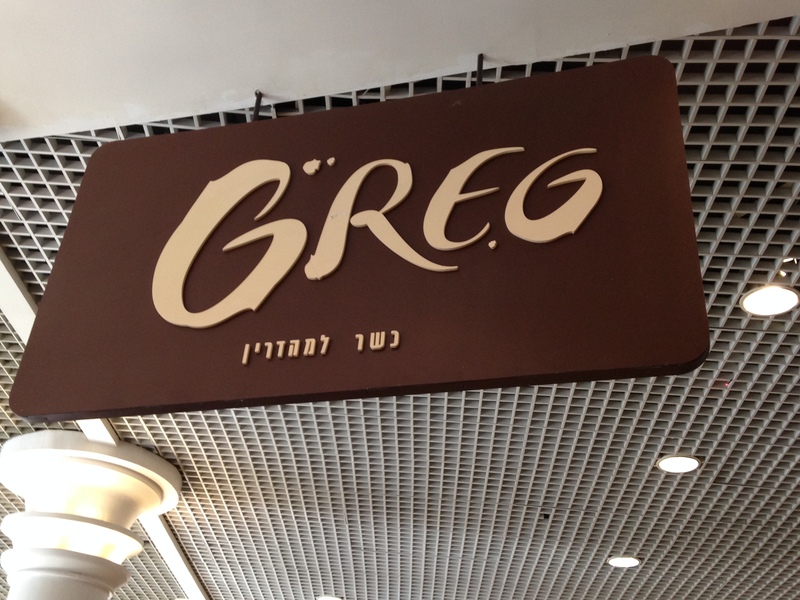 After enough walking around to work up an appetite, we went to a restaurant called Greg for lunch. 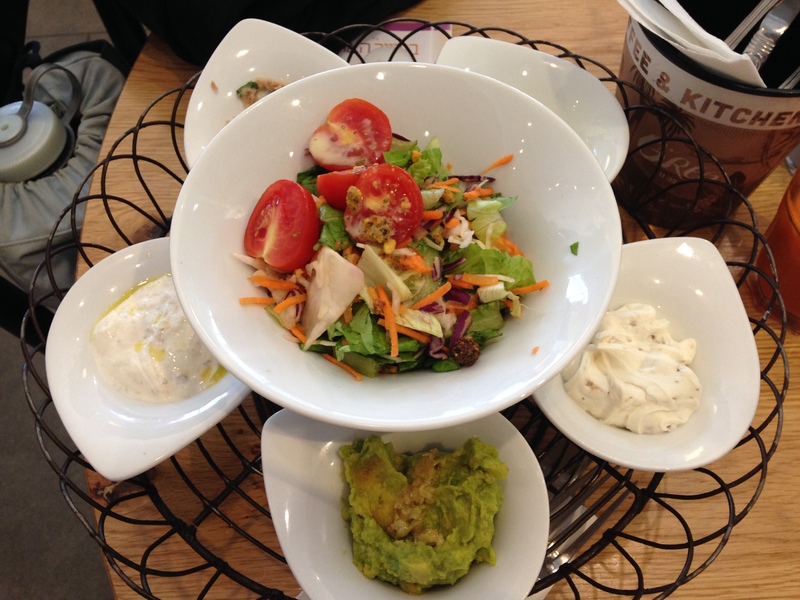 One thing that we noted while walking around the mall was that there were a lot more sit-down service restaurants than what you might find at a typical American mall. 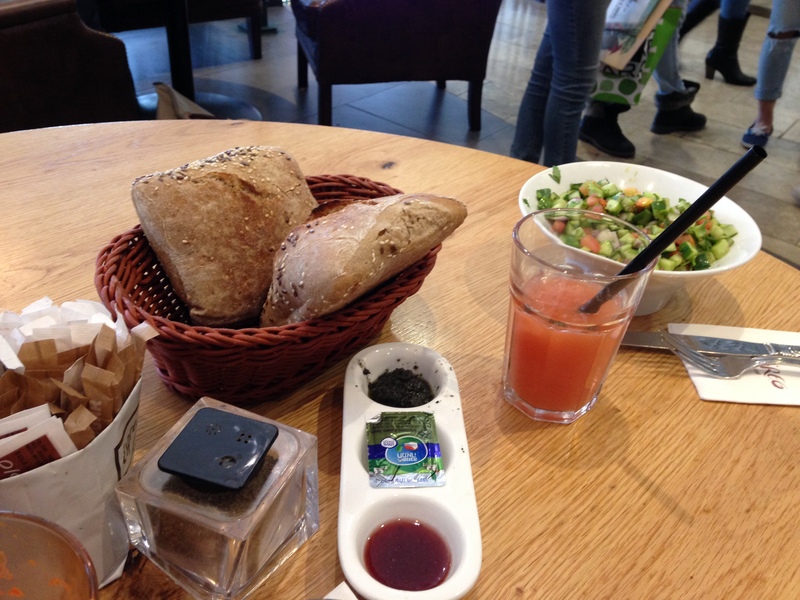 At Greg, I ordered an Israeli breakfast (I know, I’m getting predictable). The breakfast, as usual, came with eggs, bread, spreads, salads, and drinks. 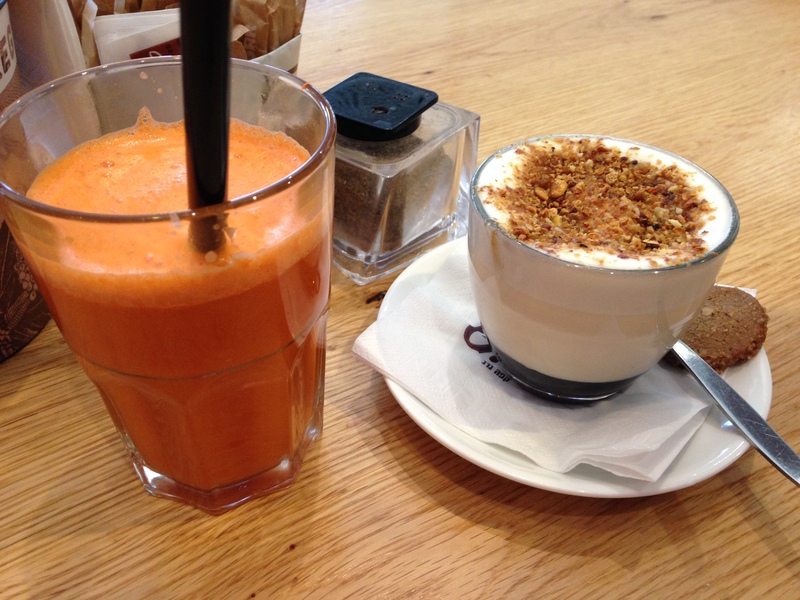 For my drinks, I ordered a carrot juice and a special coffee drink made with date syrup and soy milk. 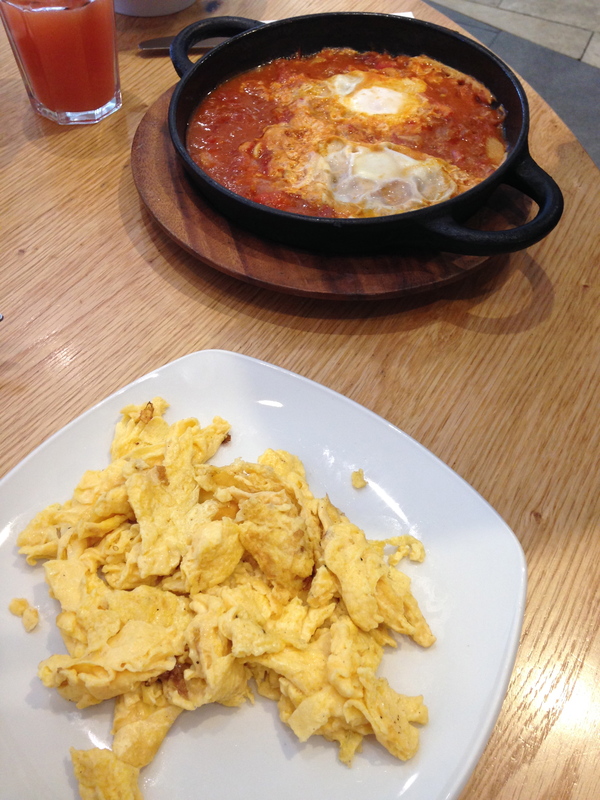 Noah ordered the shakshuka and a grapefruit juice. 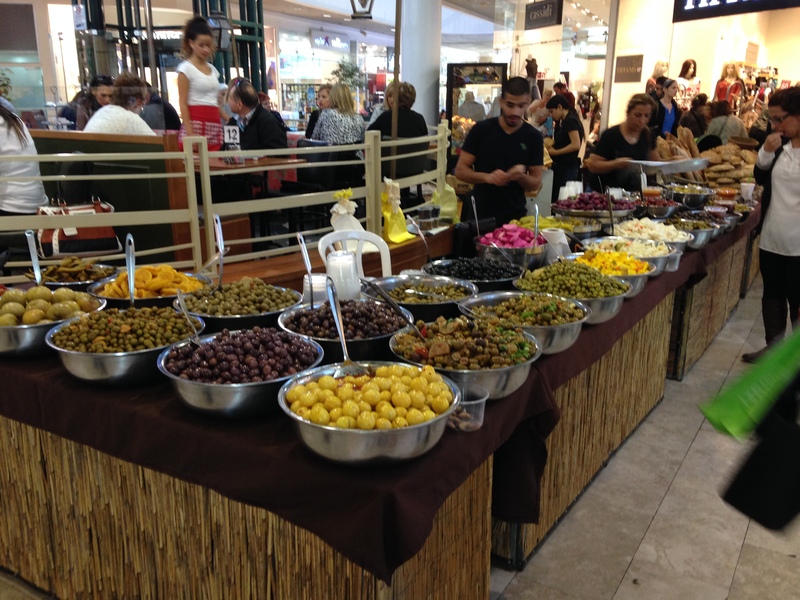 Was that a buffet of olives and fruit? You’d never see that at a mal in the U.S.